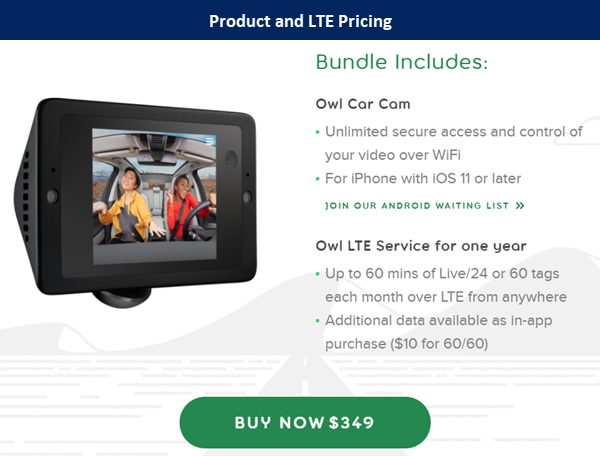 With $18 million in VC funding, and led by the former product lead for the iPod and the VP of Engineering of Dropcam, Andrew Hodge, hopes are high for Owl to have similar success in the car / dash cam market. And there is opportunity. While various companies make car cams, there is no clear brand high-end leader (e.g., Ring in doorbells). But will Owl succeed at this? 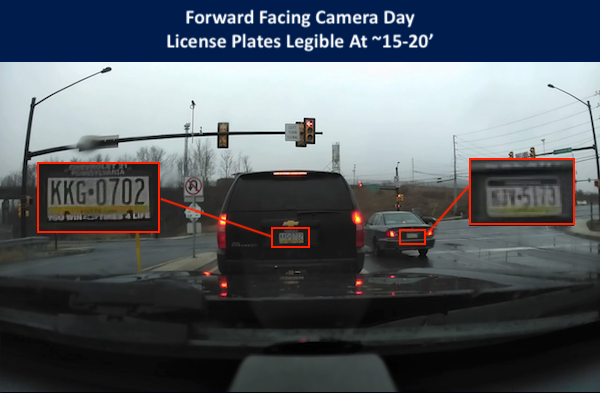 The cameras provided solid daytime video inside and outside the vehicle in our tests, with license plates and facial features clear, but details worsened in low light, failing to capture plates and muddying facial feature. Owl was also plagued by motion alerts which gave no indication of the source of the alert (inside, outside, accelerometer), making it frustrating to figure out what caused a given alert, if even possible. 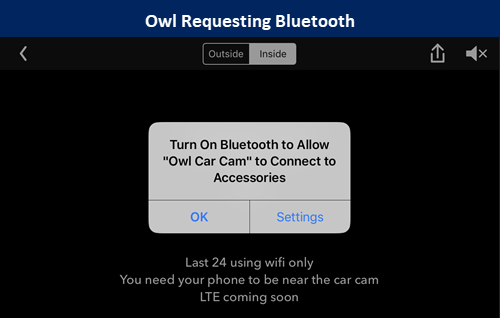 Additionally, despite on board LTE, camera recordings are only available when directly connected to the camera via WiFi, potentially limiting its use if a vehicle is stolen and users wish to review video immediately leading up to the event. Finally, in our testing, the camera rebooted itself several times while driving, 4 times in over two weeks, without any known cause or warning. 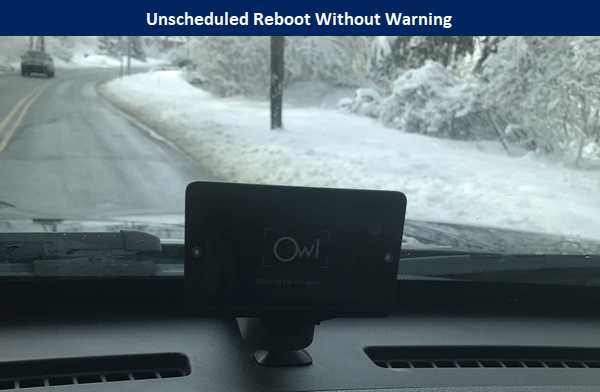 Despite its issues, the Owl camera is a novel concept, with a combination of features found on few, if any other dash cams. Additionally, Owl is a young company, only ~18 months old with ~40 employees listed on LinkedIn (but another 10 positions posted). Given time and additional engineering, Owl may be able to improve these shortcomings. 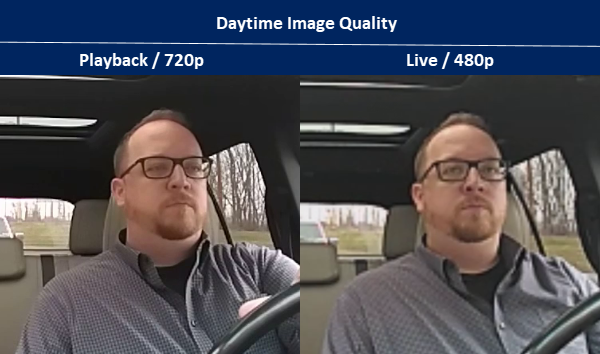 Solid video quality: Especially relative to the low quality common in car / dash cameras. Live video: Live view of video and location worked without issues in our tests, with video loading in 1-2 seconds and streaming. Live location: Real-time vehicle location was accurately updated during our tests, within a few hundred feet. Inaccurate VMD: The camera regularly reports motion when there is none detected in the scene. Vague alerts / notifications: Compounding the frustration of inaccurate VMD are vague alerts. When a "motion alert" is received there is no source identifier letting the user know if the alert was generated from the outward facing dashcam, the inward facing dashcam, or the accelerator. One has to look through video then guess what happened. Timeline video requires WiFi: To browse the past 24 hours of video (stored on the camera), users must connect via its on board WiFi, not LTE. LTE allows only manually saved clips to be viewed. Random reboots: Finally, the camera rebooted without warning several times during testing, 4 times over the course of ~15 days. At $349 USD, the Owl Car Cam is significantly more expensive than typical dash cam models, such as the Yi Smart Dashcam (~$50 USD). However, these cameras typically do not include Owl features such as LTE, VMD, live location, two way audio, etc. The BlackVue Cloud series cameras offer live look in, two way audio, VMD, and other features found in the Owl, and are priced above Owl, starting at ~$380, depending on features and storage. Owl is currently only available in the US and is not shipping to other countries. They state they do intend to offer the camera globally, but do not provide release dates for any other country. The video below provides a physical overview of the camera and power supply. Notably, its front and back facing cameras, OBD connector (detailed below), built in mics, and white light illuminators. The Owl camera has two novel installation features which improve mounting/powering the camera compared to other dash cameras we have used/tested. Wedge mount: First, the camera's mount is wedged in between the dashboard and windshield, with a suction cup holding it to the windshield. In our tests, this was very stable and did not dislodge. 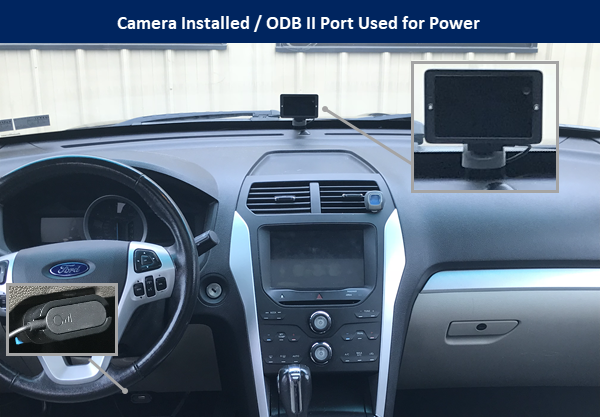 ODB II for power: Owl used vehicles' ODB ports for power, which powers the camera when the car is off and detects ignition status. By contrast, most dash cams use USB or cigarette lighter type power cables, which may or may not be powered when the car is off. Note that Owl switches to low power mode if the care is off for more than 12 hours to conserve battery. The mobile only works with iOS, though Owl has plans for an Android version "soon", with a beta waiting list currently open on their site. The video below provides an overview of the Owl mobile app. The most notable limitation of the Owl mobile app is that recorded video may not be accessed via LTE. Users must connect to the camera's local WiFi in order to view recordings. The cameras provide solid video quality shown below on an overcast morning. 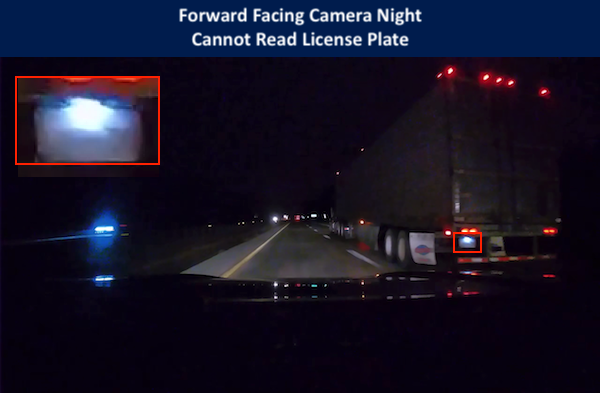 At night, the forward facing camera is unable to provide legible license plates of nearby cars, shown below. However, this video is moderately better than other dash cams we have tested, with clearer details of the road and some discernible details of other vehicles, which others could not capture. 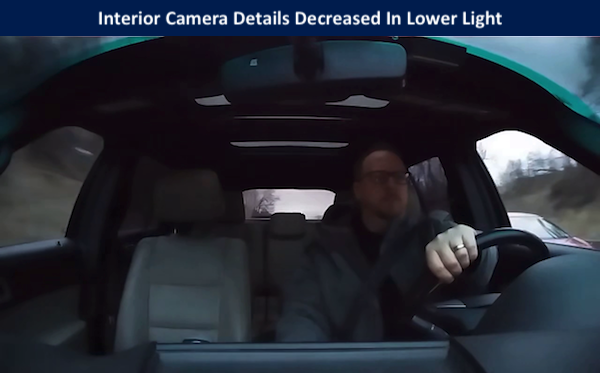 During the day, the interior camera provides clear video of subjects in the car, shown below. Note that the live look in feature provides 480p, not the full 720p resolution of recordings. However, as light levels begin to decrease, such as sunset on an overcast day shown below, facial details become muddy, with recognition more difficult. Motion generated clips as well as user generated clips are shown in the My Clips section in a horizontal timeline with outward camera videos stacked above inward camera videos as shown below. Note that the app plays back only a single clip at a time, so to review both camera angles for the same clip one will need to watch two separate videos (one for each camera). LTE is used used to connect to the camera for most activities including; viewing clips created by the user and/or motion detection, live view, two way audio, and GPS location services. The camera uses Bluetooth during setup as well as when one wants to view the last 24 hours of recorded content. The app connects via Bluetooth and then prompts the user to join the wireless network of the camera. 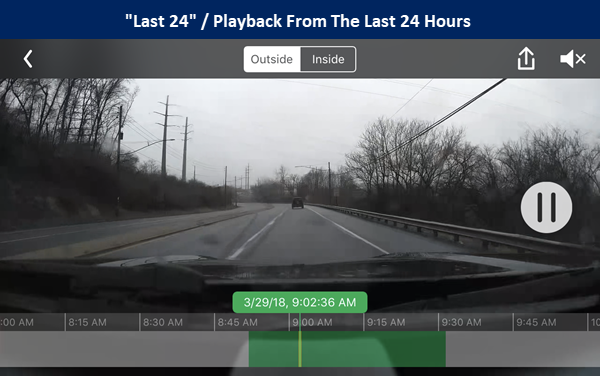 Owl's playback feature provides video from the last 24 hours on both cameras. As described above the cameras needs to be connected to local WiFi in order to retrieve the clips. Once connected, it provides a timeline of video, playback controls, and export options as shown below. Note that video is stored on the camera, with no expansion via SD slot or USB to extend archives beyond the 24 hour limit. This may be a limitation in some cases, if users cannot access the camera immediately post-accident, for example. Finally, during our tests, the camera rebooted multiple times with no warning while driving. This was infrequent, happening 4 times over the course of 15 days, but occurred with no visible cause. The most current firmware available at the time of testing was used in this test.